The Maldivian government will fulfill all of the people’s needs, and if it can’t be done using the State’s income, then the Maldivian government will explore alternative methods of finance in order to do it, says Maldivian President Abdulla Yameen Abdul Gayoom. Addressing the people of K. Thulusdhoo after the function held to inaugurate the island’s harbor this Sunday morning, Yameen said one of the biggest questions directed at his government is on the national debt. He said that many people ask him how he plans on settling the national debt. “Every day that goes by is a day that’s lost. Every year that’s lost is five years which puts us further away from development and our hopes and dreams. So we need increase income, and find ways to increase income while we have the time to accomplish all this,” said Yameen. 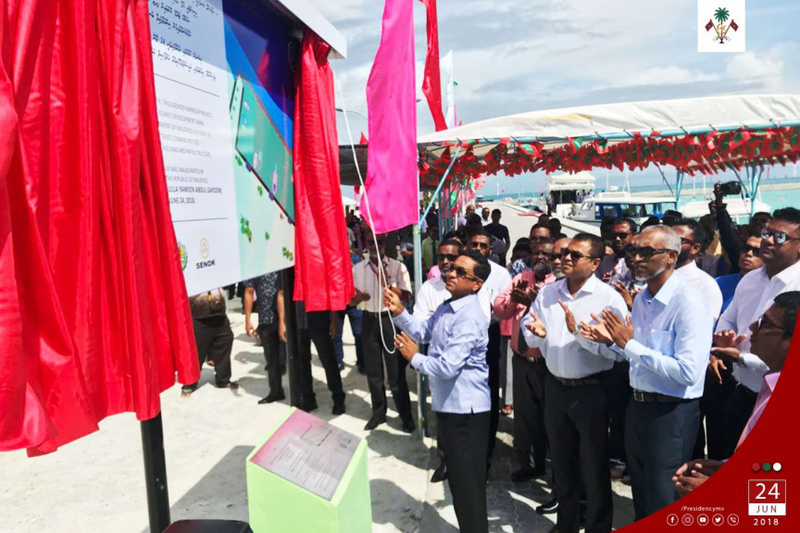 Yameen said that the people of Thulusdhoo would have found it unacceptable if the MVR 40 million harbor project at the island had been delayed because of lack of State budget. And like the people of Thulusdhoo, people in every other island want infrastructure development projects they need to be completed as soon as possible. He said that if the development projects can’t be funded from the State budget, then his government will ensure its done even if it has to take loans in order to do so. “My mindset is to further increase the national debt. I will continue to increase the national debt. I will accomplish what the people need. I will fulfill all the needs the people find lacking,” said Yameen. Yameen said his development projects can be seen from across the country. And provided assurance he will continue to develop Maldives. He said statements by his presidential rivals that they see no way to settle the national debt is confession of their inadequacy to assume office.